Crossing is a movie about North Koreans fleeing to China in desperation. Once in China, North Koreans are in danger of being caught and repatriated to North Korea, where they will be sent to a work/death camp for their treachery against the great leader/god Kim Il-Sung (by the way, how are those Olympics going, Beijing?) They must either get into another country's embassy and claim refugee status, or travel secretly through China, and escape either to Mongolia or head south, and claim refugee status in a southeast Asian country -- Thailand, Laos, Vietnam, etc., and hope that Seoul will take them. In the film, Yong-su (played by Cha In-pyo), a North Korean living in a mining village in Hamgyeong Province, crosses the northern border with China to get food and medicine for his ailing wife, only to find himself on the run. His 11-year-old son (Shin Myeong-cheol) also risks his life to trace his father in China. Anyway, because of this propensity toward bombast, my expectations weren't TOO high, heading into Crossing, because I knew the topic ran risk of veering wildly into melodrama, but it managed to treat its subject with at least a modicum of grace. This was good. Even when we saw that Yong-su has a dog, and everybody who knows Korea thought, "Heh. This is Korea. . . I know what's gonna happen to that dog". . . they managed to treat Whitey's mysterious disappearance as a sad surrender to poverty, without overdoing it until it became a punchline. As with most sad movies, the first thing they do is show you some people living a basically happy life, and you see enough of them to decide you like them, and want good things to happen to them, before bad things start happening to them (cf Dancer in the Dark). In reading up for this post, I learned here that the film was written after extensive interviews with North Korean defectors. At first, I was a bit cynical, thinking things like, "I like this character too much. . . she's definitely going to die." But, when bad things start to happen, the filmmakers mostly told the story, and didn't spend TOO much time telling viewers how to feel. Mom coughs. Later, she passes out during the town meeting. Turns out she's pregnant and has tuberculosis from malnutrition. Medicine for pregnant women with TB is hard to come by in North Korea, but Yongsu, the father, has a friend who is a trader bribing his way back and forth to China, who is also surreptitiously handing out bibles. Then other bad stuff happens, and some more bad stuff, until Yong-su has to go into China himself to try and get medicine. . . and then he'll come right back! But then other stuff happens, so that he might not be able to come back, and his son has some bad stuff happen to him (no more spoilers today!) and needs to cross into China to try and find his father. My favourite character was Misun, the cute daughter of the bible-smuggling trader. We see her at the beginning, and then we meet her again later, and her character arc is one of the sadder ones (though nobody's going to quite out-tragedy Yong-su). I won't say the film is completely without melodrama: I'm sure one entire round of auditions for the actor who plays Joon (the son) consisted of nothing more than, "OK. I'm gonna point a camera at you, and I want you to cry convincingly, and say these words while you're crying". . . but the use of slow-motion and echoing shouts of despair as the world falls silent didn't slide into overkill, nor did the silent montages of "remembering the happier times," and frankly, the movie was touching, and the ending was very appropriate. The acting, too, was well done, and the two children especially impressed me, given that making bad things happen to children in a movie is the fastest way to generate pathos, but also runs the greatest risk of slipping into bathos (mawkishness), but the kids never quite went too far, nor did the filmmakers. There are a few sad conversations about heaven prompted by the missionary character and his daughter: "a place where I won't be hungry?" "I hope they have still rain there" and by the end of the movie, heaven's function is mostly just to be the place where certain characters can finally see. . . certain other characters. . . again, if ever. In fact, that seems to be what's playing behind the ending credits: all the characters in the movie are eating and playing by a riverside, including the ones who wouldn't be able to attend an earthly riverside picnic. There's also one angry speech asking, "Why does Jesus only help the South? Is God's help also only for the rich?" Those questions remained unanswered in the film, and yeah, the hope of heaven is mentioned, but in the face of thousands of starving people who need FOOD, too much talk of heaven would become problematic, and the filmmakers were wise not to dwell on it. I'm going to talk about this movie in my classes next week, and see how the response is: so far, the times I've sent out feelers, most South Koreans seem not to really want to see this movie. Too much of a downer. In one way, I think South Koreans kind of think of North Korea the way one might think of a deadbeet brother who, every time you send him a christmas card, writes back asking if he can borrow money, or insults your kids. Yeah, he's family, but it's too frustrating, costly, and draining to expend mental energy toward him. I've sensed this kind of dissociation toward the North, even just in the time since I've come here, people in the south feel more ambivalent, less connected, with the north. Less willing to help. And yeah, if your brother either insults you or ends up costing you money every time you see him, wouldn't YOU dissociate yourself, too? on the other hand, I'm also outraged that Koreans can be so complacent about SUCH a desperate situation, so close, to people who are their great-uncles and second-cousins. It's only by a trick of geography that South Koreans were lucky enough to be here instead of there when the Military Demarcation Line was drawn. . . how can you write off your own kin? In my darker moments, I think that South Korea's apathetic attitude toward what's happening in the North (other than insofar as Kim Jong-il might have weapons that threaten the south) is the ultimate refutation of Koreans' claim to have that mystical "jung" -- some deep connection between humans that only Koreans could experience or understand. How could you claim "jung" -- some deep, humanizing connection between Koreans, when many of your own are starving to death and eating dirt just to remember the feeling of having something in their stomachs, and you won't even go to a damn movie about it (prefer watching schmaltzy music videos where the tragedy's fictional, I guess)? The filmmakers had a hell of a time even finding funding for their movie, because South Koreans keep NK at SUCH an arm's length. Investors didn't think the film would make any money. No jung, gentle readers. No urgency? No feeling of need to have this story told? No jung. It's not often I feel it quite THAT strongly, but those are the two extremes. And that's the puzzle of North Korea. Yes, very well put. No jung. Jung is the Korean way of expressing what happens when the empathy switch gets turned on. Often, unfortunately, its default setting is off. When would they have time to see it? Most are too busy protesting the U.S.'s disease-riddled meat (of course, this is utter crap). And, it's the same U.S. that helped to keep them from experiencing the brutal hell that most of their cousins have lived with for over 50 years. Lack of empathy -- must be a Korean gene. Too bad that most here in the South care more about a damn cell phone than human life. When I read what you wrote, the first thing that popped into my mind was "out of sight, out of mind" even more so than a "deadbeat brother." I think what is ultimately destroying the connection between the two countries is the simple fact it's becoming harder and harder from them to relate to each other. As S.Korea continues to modernize, N.Korea will become more like a distant cousin to whom S.Koreans can relate to only by blood, geography, and the occasional very depressing news article. Their lives are so different now and worse, neither can experience what being in the other's shoes is like, jung or no jung :P. Indeed this is the purpose of such films as the one you mentioned - but there comes a point I think, it becomes simply too emotionally demanding for the younger gen to muster up the appropriate amount of empathy (equal to their parent's gen) for people who are becoming more and more alien to young movie-going S.Koreans. This isn't a justification of course - but I think the growing ambivalence of S.Koreans to N.Korea is simply an example of universal human behavior, not a "Korean gene." The interesting thing is - I get the feeling that younger Koreans (ones who can't really relate to the feeling of having a family member "lost" over the border) are torn between being socially and morally "obligated" (and in fact EXPECTED) on both a national and global level to have a close connection to N.Korea and actually FEELING this way. Hence the unfortunate air of hypocrisy. In a way it's a given that being reminded of this obligation would hardly be a something eagerly embraced especially when you're just looking to kick back and relax. And again, I'm not disagreeing with the post - I pretty much agree with everything. Just toying around with other possible reasons. Tangent: Implying that Koreans are somehow genetically incapable of having certain emotions smacks of hypocrisy and racism. Especially with the observation that you're obviously not inclined to very much empathy or understanding yourself. And if you're going to say S.Korea doesn't need/deserve any empathy....that'll just be another nail in the coffin. hi there anon. I think you hit a lot of points right on the nose -- it really IS an out of sight, out of mind thing -- and it's unfortunate, because the tragedy gets worse every day, but yeah, being reminded of that obligation is a burden, and it's much easier to think about what model of cellphone I want next. However, while you're right that "out of sight out of mind" IS a human trait, and not specifically Korean -- we've all switched the channel when the "sponsor a child with world vision" TV ad comes on -- if you read more carefully, you'll see that I never implied that Koreans' apathy toward their northern kin was due to a genetic disposition of any kind. To do so would be ignorant, racist, and far beyond the depth of a liberal arts major who never studied genetics OR psychiatry. as for your tangent, I'd like to see you demonstrate where in my article I implied Koreans are genetically incapable of any emotion, or undeserving of sympathy. . . maybe you were reading another article at the same time as mine? Yeah, I expressed disappointment at where South Koreans choose to direct their gaze, and took issue with Koreans claiming "jung" as an emotion that they can feel DEEPER than any other race (which is racist in itself -- implying ONLY Koreans can feel deep connection with each other, and other cultures are incapable of feeling a connection as deep as theirs). All cultures are capable of jung -- it just looks different from culture to culture, so Koreans don't recognize the jung in two Canadians washing dishes together silently, because they aren't trading soju shots (or doing one of the other common KOREAN methods for expressing jung). As for my own capability to experience empathy and understanding, I don't think expressing the fact I'm of two minds in my observation of Koreans' reaction toward North Korea puts me either here or there (and certainly not outside the realm of being ABLE to feel empathy). You'd probably have to talk to my friends about that, rather than reading so much into a statement of ambivalence about North/South relations. But thanks for your comments -- as I mentioned in the article, I have a lot of mixed feelings about this one, ranging from very optimistic to very bleak, and it changes from day to day. Hope you get a chance to see the movie! oops. i see. you were responding to john from daejeon. the lack of empathy thing is an interesting topic. . . joshinggnome is actually writing a series about it on HIS blog right now, that might be worth reading when it's finished. i'll say more about my thoughts on that in my comments to HIS posts. Empathy--In the last two years, I've had two students commit suicide and their fellow classmates don't even bat an eye when they hear the news as they continue to text away before classes. Now today, one of my favorite middle school students totally lost it under the strain of cramming for middle school mid-terms. Now, I am so worried that I won't sleep at all tonight, but there is nothing I can do in this country for kids like this one or those who suffer from mental disorders that could be easily remedied if the stigma (loss of face) wasn't so severe for the parents. Even my (Korean) bosses and fellow teachers worry at this time about our students, but it is better not to offend (save face) the parents than to reason with them and to actually try and save a child's life. Sadly, money (instead of love, decency, and kindness) makes the world go round, and North Korea is only seen as a drain on the South's finances. Same with someone sticking up for those children suffering from all the pressure that is being placed upon them. The offended parents of these children would swiftly remove them, and their tuition, if someone even hints that their "little emperor or empress" might have a learning disorder or be suffering from total mental exhaustion. Worse yet, you might get sued here for actually exposing the truth and seeking help for these children before it is too late! In closing, I know that the world is a pretty screwed up place, and I know I'm a sucker for giving what I can to the likes of http://www.linkglobal.org/ and http://www.feedthechildren.org/ , but I like to think that it helps to keep me human. The alternative is to enclose one's self in an uncaring and unfeeling bubble and go about your life like an emotionless robot. p.s. The gene remark is a reference to the screwed up priorities of many who have shanghaied the meat issue to further their own political agendas. I bet if they, and their children, were starving; they would gladly scarf down British beef and GM corn if it meant the difference between their lives or their deaths. Roboseyo, you make some good points. I asked my (Korean) girlfriend if she would be interested in seeing it and her reply was that it was too depressing. For her and her friends films are all about recreation not reflection. There is also a complete lack of interest in North Korea. It exists but is uncomfortable to think about, I suspect. The divide in Korea, has a sad, long and complicated history. It's messy, tangled up in egos, and within a month it began, US and the Soviet Union got involved - and I think we can safely say - this was certainly a part of something bigger. You can be critical of political efforts (or lack of) by the S.Korean government, but I often find that you can't judge the political decisions of a government necessarily on the people. Yes, US had a hand in the war, did they help? in some ways yes, in other ways, definitely not. Whether it was a move made by a certain US General or even if S.Koreans were killed because they were thought to be N.Koreans. The actions of the ALL of the nations involved led to the divide in not just a nation, but of families and friends. S.Korea has tried to send med/food aid to N.Korea - sometimes the efforts were hindered by N.Korean decisions or outside nations who wanted to talk Nukes before talking about helping the civilians in N.Korea. 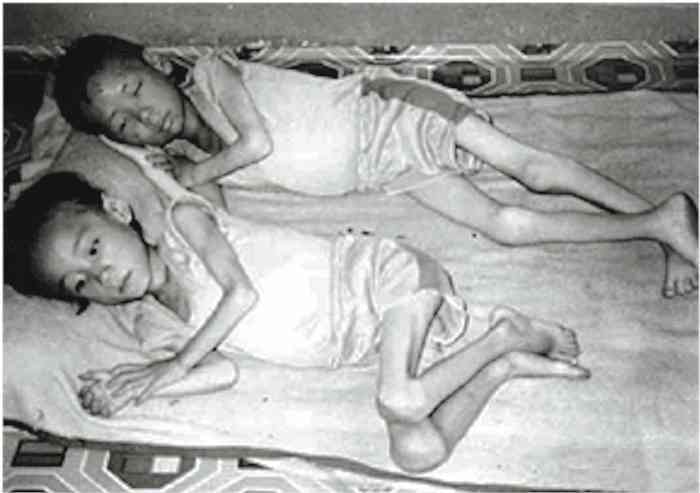 The poverty that is prevalent in N.Korea is not unlike the ones felt in other nations. But they're all tangled up in politics even though it shouldn't be. You can criticize the lack of political efforts, sure. But the people? Anywhere you go, where there are people suffering at the hands of certain groups, including the US, where's the Jung by everyone else? Where is the Jung for humanity there? Your perspective about disassociation, etc. may apply to some in Korea and Koreans abroad, it could be out-of-sight-out-of-mind as some other commentator said. This isn't that different from people who don't want to watch movies on the Holocaust, suffering of people in the volatile nations within the African continent, Iraq War, poverty stricken nations, nations ravaged by war, etc. I know plenty of people who would REALLY cry and be genuinely affected by this movie or about any other movie about many of the examples I mentioned previously, regardless of their nationality/ethnicity. I think it's interesting that you would talk about Jung. It's a word that defines something that isn't necessarily tangible or even visible. It's more than empathy. It's like that connection as you described. Personally, I think the answer is in Jung. That's what makes my heart actually ache when I watch documentaries of N.Koreans who try to defect. (I realize you may think this is melodramatic, but hey, there's really no other way to describe it.) But it's because of this Jung I feel what I feel when I see the hardships these people who look like they could be my friends and family in Korea face. And beyond that, it's the same Jung I feel when I watched movies, documentaries, etc about the Holocaust, met people who have survived the Holocaust and other more recent wars. But this Jung, for other people, could lead them to have the opposite effect - like, it's actually too hard to watch, to think about, to argue about, or whatever. It's also about everyday life right? Korean economy, like a lot of other nations', is getting pretty rough for almost everyone. When the people are so angry by the government's willingness to fall under the pressure of another nation's government (the Beef ordeal is just part of the bigger problem), the cost of living is going up while the pay stays the same, people are losing jobs, families are being torn apart because they can't afford to stay together, etc. I can partly understand why there is no consistant reaction/action by the people. But by no means, I don't think it's some kind of excuse to not worry about the hardship of N.Koreans. But it's not hard to get caught up in our own worries despite being aware of the plight of others - it happens everywhere. Believe it or not, I wanted to write some other stuff, but I've definitely taken more than enough room here! I really like what you said about "out of sight out of mind" and the fact a lot of people simply turn their gaze away from sad truths, basically because it's sad. The reason I brought jung into the discussion is not because I think Koreans have no jung, nor that other countries do, while Koreans don't -- mostly, I brought it up because I've had Koreans tell me that ONLY Koreans have Jung. I'd argue that any person who gives money to help strangers in other countries, who sponsors a child or a village, or volunteers in a disaster area, has jung (not just Koreans who do) and anyone who ignores the hungry, the disadvantaged, disaster victims, and the extremely poor, lacks Jung (again, not just Koreans who ignore them) -- the way Koreans deal with North Korea (out of sight, out of mind . . . look away! look away!) is exactly the same as the way North Americans deal with news and images of extreme poverty in other parts of the world -- that is to say, I don't think Koreans have any MORE jung than other cultures, but no less, either, because they respond the same way to such situations. and you're also right that the north Korean situation is much more complex than the way I've put it in this (too short) post -- food aid gets funneled into the NK military, rather than going to the civilians it's meant to help, and basically, as long as Kim Jong Il and his crew are in charge of north Korea, NK is screwed. I DO often feel like South Koreans ought to be pressuring their government to be more proactive on the North Korean issue, and (because they're politicians) it often takes a public outcry before they decide something's important enough (that is, influences enough votes) to do something about it. That's a sad reality. I don't think unconditional aid is the answer, if it's just going to feed the NK army, but I DO think that if South Korea expressed more concern for the north, that South Korean politicians would be more proactive in trying to find solutions to the current stalemate. Especially in light of protests over a manufactured beef scare, it's frustrating that South Koreans are taking to the streets over a non-issue that's never killed a single Korean in America OR in Korea, when thousands of North Koreans starve every month (and would be happy to eat the beef that many south Koreans spurn). I'm not saying that NO koreans have jung, but I'm arguing against the idea some Koreans have that ALL Koreans have jung, while all non-Koreans don't. anyway, thanks so much for your comment! I'm glad to have the food for thought, and I hope the time you took reading my post and this comment was worthwhile. My Korean wife insisted on going to see it, any idea when the dvd is going to come out? I watched the film with out english subtitles in korea and i still got the most of it. Yet another compelling reason as to why "god" can not possibly be. History will judge humanity harshly for the obscenity of North Korea. Some videos and no commentary whatsoever. Let's not get TOO down on Korea. More mad cow. Cripes I'm tired of this. Like Spiderman teaming up with Wolverine. . .
How to Make YOUR American Beef Safe! Here's a story about how dumb I am. Bumped into a Blockade today.